Festive cake "NEW YEAR SURPRISE"
THIS CAKE BECAME A REAL NEW YEAR SURPRISE FOR MY DAUGHTER AT HER BIRTHDAY! Mix butter with sugar. Mix, till sugar melts. Mix flour, ground nuts, baking powder and cocoa-powder. Add chocolate topping. Slightly mix. Grease form with butter and sprinkle with flour. Spread dough in form and bake for 50 min in preheated at 175 C oven. Remove from oven, let it cool, and in 10 min cut in 3 flat cakes. Mix cream with vanillin and sugar powder. Melt zephyr in water bath, pour it with lemon juice. It should increase twice. Add dye to it and stir well. Then gradually add sugar powder, sifted through sieve, and stir. Once mastic is like plasticine, it is ready! Wrap it in food film and put for 30 min in fridge. In 30 min decorate as you wish!!! Details of figures from mastic are glued with help of cold water (drops!). 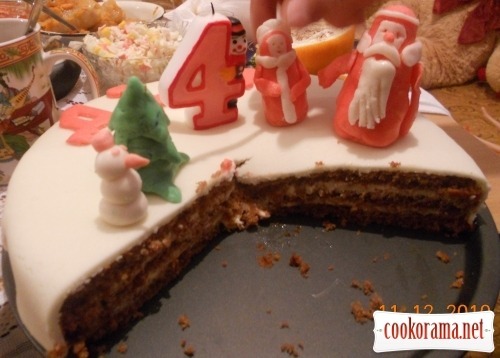 Bigger figures (Santa Claus, Christmas tree, the Snow Maiden) are settled on cake with help of toothpicks! Ready figures or mastic can be stored in fridge or freezer for 6 months! GOOD LUCK, FANTASY, SWEET HOLIDAYS, OF COURSE. BON APPETITE! 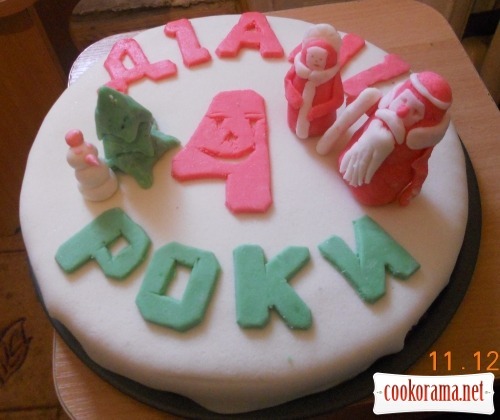 Top of recipe "Festive cake "NEW YEAR SURPRISE""
Оце клас!!! свято напевне вдалося на славу з таким тортом. Тут тобі і день народження і новий рік, такі довгождані для нас свята. ДЕНЬ НАРОДЖЕННЯ ПРОЙШОВ ГАРНО , ПЛАВНО ПЕРЕРІС У ДЕНЬ СВЯТОГО МИКОЛАЯ , А ПОТІМ — У НОВИЙ РІК !!! ТАК ЩО, СВЯТО ТРИВАЄ! Вітаю Діанку з Днем народження! Гарний вийшов тортик -дітлахи мали бути у захваті! БЕЗМЕЖНО ДЯКУЮ ЗА КОМЕНТ І ОКРЕМЕ ДЯКУЮ — ЗА АНІМАШКУ!!! У ЗАВХВАТІ БУЛИ НЕ ТІЛЬКИ ДІТЛАХИ, АЛЕ Й ДОРОСЛІ . СЛОВОМ, СВЯТО ВДАЛОСЬ! Дуже гарний тортик! З таким оформленням будь-який пляцок мегатортом стане! Супер! Recipes, Cakes, Festive cake "NEW YEAR SURPRISE"